DailyWe is changing the way news is read and delivered with its advanced personalized news experience that meets the needs of modern–day consumers by combining the best of journalism, technology, and community. DailyWe licenses content from hundreds of the world's best journalistic sources, allowing users to read full articles, share them and comment on them all within a single personalized news experience. The 24x7 news environment hasn't quenched readers' thirst for news – it has increased it. And readers flooded with information are demanding more relevance and quality – in short, a personalized news experience. To capture their attention, news publishers must deliver news that is most pertinent, personal and prompt. DailyWe can deliver for you on all three counts. 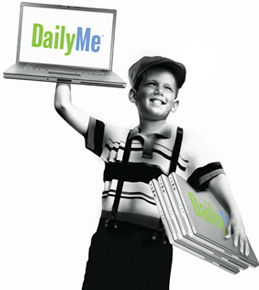 At DailyWe.com, users have access to three views of the news – editorialized, personalized and socialized. The personalized DailyWe section allows users to select their news preferences from topics, sources, or keywords. Top News presents the most important stories as selected by the DailyWe editorial team. DailyWe is driven by our community, including our unique Meme–It feature that allows users to rate stories by emotion.